2018 saw hope and attention return to the uranium market as supply fell and demand rose. Here are our top uranium news stories of the year. At the end of 2017, many uranium market participants were calling for improvements in the industry — and with 2018 close to an end it’s safe to say those predictions were accurate. Over the last year, the U3O8 spot price has risen about 40 percent, and more growth is predicted moving forward. 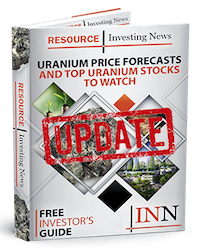 Unsurprisingly, our most popular uranium news stories of 2018 focus on market predictions and commentary from experts on potential catalysts. Scroll on to see which of our uranium articles received the most attention in 2018. And let us know in the comments what uranium news stories grabbed your attention this year. Our top uranium news story of the year is an interview with Leigh Curyer, CEO and director of NexGen Energy (TSX:NXE,NYSEAMERICAN:NXE). Speaking at the PDAC convention in March, he suggested that uranium prices would rise in 2019 and 2020, spurred on by major supply cuts. In April of this year, Russia responded to US sanctions by drafting legislation that would allow bans or restrictions on imports of a slew of US goods and services. Notably, the draft bill also called for a halt in trade between US nuclear power companies and Russia’s state-owned nuclear company Rosatom. Russia has not yet imposed such sanctions on the US, although in August the US introduced a bill that includes restrictions on Russian uranium imports, among other things. Back in January, resource industry veteran Rick Rule of Sprott (TSX:SII) suggested that 2018 could be “the year that uranium turns” — although he also reminded investors that uranium is “a when market — there’s no doubt [a turnaround is] going to happen” at some point.